This is a fun and simple twist on a regular mesh wreath! You need all of the same supplies as a regular Deco Mesh wreath, though you may also want to grab a few extra colors for this one. Making mesh wreaths is a fun and simple way to decorate your home for every occasion. You can even customize them to give as gifts for birthdays, holidays, weddings and baby showers. 1) Cut 3 pieces of the moss mesh (10” x 15” ) and roll them diagonally so they’re long and have a point on the end. 2) Staple these rolls to the back of the circle in the center so that three points stick out of each side (like leaves). 3) Now cut 6 pieces of the daffodil mesh (10” x 20”), fold them in half (now they’re 10”x10”) and pinch everything at the bottom together to form a sort of bubble, you have to play with the mesh and mold it a little. 4) These yellow “bubbles” are the petals, twist them at the bottom and staple them around the outside of the front of the cake circle, 6 petals should fill the circle but you might need more. 5) Now cut 6 pieces of the orange mesh (10” x 5”), let them curl the way that the roll curls so you have 6 rolls resembling the actual roll of mesh. 6) Staple these rolls one by one in the center to the front center of the circle, filling the space inside the petals, you might need more than 6 rolls, you also have to open the stapler for this part and staple on a hard surface. 7) Add a twine or ribbon loop to the back to hang it. If you love crafting with deco mesh, check out our Deco Mesh collection! 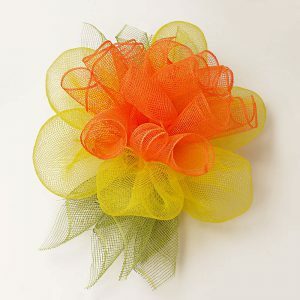 We offer a wide variety of deco mesh ribbons in different sizes and finishes. If you’re going to make your own, don’t hesitate to share it with us on social using the tag #mypapermart. For more DIY craft videos, product features, and tips for small businesses – stay tuned! We’ve got them coming. I am trying to put together a shopping list for supplies to teach this as a class for the ladies at church. But I don’t understand your quantities. For instance, under supplies, you list 10″ of 10 daffodil. Then the instructions say ” cut 6 pieces of the yellow mesh (10″x20″) . I don’t know how I’m going to get 120″ out of a 10″ piece. Please clarify. Photos of steps would be helpful. Hello Karen, we’re so happy to hear you’re interested in making this project! Your class sounds like it will be lovely. 10″ X 10 means 10″ X 10 yards. That’s how big our rolls are. Therefore, you would be able to get (6) 10″ X 20″ pieces out of that roll. We updated the description of the materials so that it is easier to read. Thank you for bringing this to our attention. Please let us know if you have any other questions. Happy crafting! Do you sell paper placemats? Hello Nan, unfortunately we do not offer paper placemats at this time. We do have table covers which you can view on this page http://www.papermart.com/Colored-Party-Plastic-Table-Covers/id=90602#90602 and large paper doilies which can work like placemats on this page http://www.papermart.com/paper-doilies/id=49807-INDEX#49807. Please let us know if you have any other questions. Thank you and have a wonderful day! Nice idea but what is a cake circle, please? Hi Elaine, a cake circle is a decorative cardboard material that is used to insert into a cake box. For this project, you can cut out your own cardboard circle or you can shop one of our beautiful shiny ones here http://www.papermart.com/bakery-drums-circles/id=53587-INDEX#53587. Please let us know if you have any other questions or if there is anything else we can help you with. Thank you and have a wonderful day!